Some of you might remember that I celebrated the Chinese New Year 2017 with a selfmade Chinese steamed buns dinner at home at the beginning of the year. Aren’t these dumplings? Well, no. 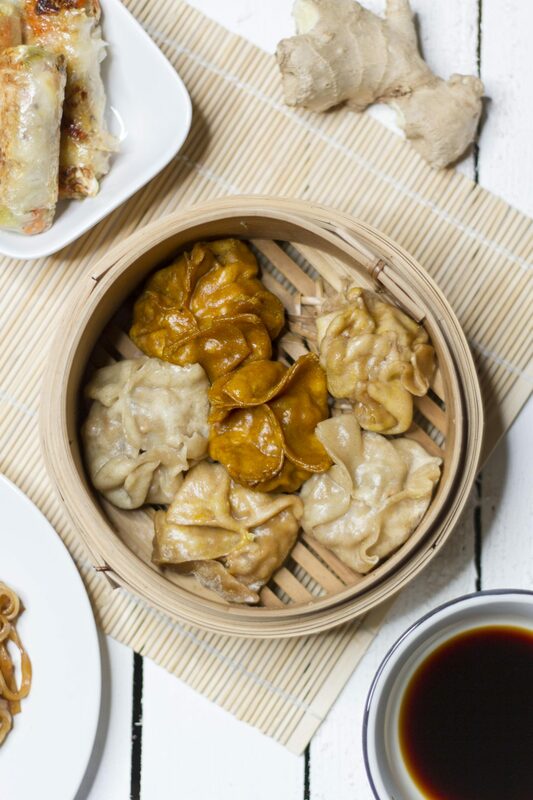 Even though the dough Chinese steamed buns recipe is similar to Chinese dumplings, baozi are round in shape, whilst dumplings are usually differently shaped. Heat the water until it is lukewarm and mix the yeast with the warm water and 1/4 tsp sugar. Let the mix sit for 5 minutes. Prepare the flour in a large bowl. Pour the water with yeast slowly to the bowl and stir. Cover the bowl and let the dough rest for around 1 hour or until the dough has doubled in size. When the dough is ready, get it out of the bowl and punch the air out. Then roll the dough into a long log around 1 inch in diameter. Heat up the oil in a pan, then stir fry ginger and garlic until you can smell the aroma. Add the scrambled tofu in with salt and light soy sauce. Mix well. Remove the pan from the heat and mix in the chopped spring onions in. Then we have the fillings. Add the filling to the middle of your baozi wrapper, then start folding the baozi in a circle. Brush some oil on the bottom of each baozi and put them into the steamer. Heat up water in a pan and begin to steam. Steam for at least 15 minutes after the water begins to boil. Once steamed, your baozi are ready to eat – Enjoy! 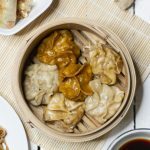 So… what to have with your baozi?